Williams gets a takedown and softens up Godsey with body shots. Williams grabs a knee bar and gets the submission at 1:54. Ken Shamrock of the WWF promotes his "Ultimate Ken Shamrock" pay-per-view special, featuring his early UFC fights. Tanner (17-1) is coming off a win over Darryl Gholar at UFC 18 via rear naked choke. Ignatov is a five-time Bulgarian Sambo champion and is making his UFC debut. He is part of the Shamrock 2000 group, led by Bob Shamrock. Tanner gets a takedown, and both men start trying for submissions. Tanner blasts Ignatov in the face several times. Ignatov somehow survives, but Tanner destroys him with several huge elbow strikes for his second UFC win. Bas Rutten talks about his UFC 18 win over Tsuyoshi Kohsaka. He also previews the Smith-Randleman fight, since he will face the winner for the vacant UFC title. Smith, 37, won the UFC title from Coleman and beat Tank Abbott before losing the belt to Randy Couture. Smith's record is 4-1. Randleman, 27, is a two-time NCAA wrestling champion from Ohio State University. He has a record of 6-2 and says the only way he can lose is via head kick. Not much happens in the first three minutes. Randleman finally checks a kick from Smith and takes him down. Smith doesn't take too much damage, and referee John McCarthy stands them up. Randleman takes Smith down but allows him to get back up, surprising the announcers. However, Randleman scores a third takedown. Smith tries a keylock from the bottom, but the 12-minute time limit expires. During the break, Coleman tells Randleman to take Smith down one more time, and he'll win the fight. Randleman does that but lets Smith up, disappointing Coleman, but Randleman gets another takedown and a flurry of punches. Randleman wins by unanimous decision and advances to face Rutten for the title. He lets out a victorious Tarzan yell. "I'm quick, I'm fast and I'm in shape." Randleman and Rutten give each other respect going into their title fight. Horn (22-4-4) was very impressive in his middleweight title shot against Frank Shamrock, which Horn lost. He also lost in Brazil to Ebenezer Braga. Liddell won his UFC debut over Noe Hernandez and won a non-UFC bout in Brazil. Horn hits a high kick, but Liddell shrugs it off and grapples Horn down to the mat. Liddell lands a lot of punches, but Horn catches him in a heel hook. Liddell escapes, and McCarthy stands them up at the 10-minute mark. Horn takes Liddell down and goes for a reverse rear naked choke. Time runs out, but McCarthy rules that Liddell went out just as the fight ended. Horn gets his first win in the Octagon over a future Hall of Famer. Goodridge returns to UFC for the first time in two years; he had a pair of hard-fought losses to Don Frye. 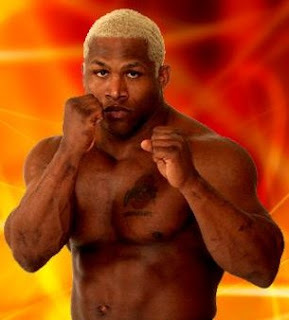 Andre, a 370-pounder with a Mohawk, has been successful in the Octagon with a win over "Dirty" Harry Moskowicz at UFC 17. He is subbing for Tank Abbott, who has the flu. Goodridge breaks Roberts' nose with a right hand, and Roberts turns away and taps out at the 45-second mark. Blatnick interviews Randleman and Rutten to preview their title fight on May 7. Matchmaker John Perretti also talks with the announcers about the fight. Ortiz, subbing for Vitor Belfort, wants to avenge his UFC 13 loss. Mezger is looking for revenge as well. Ortiz defeated his teammate, Jerry Bohlander, at UFC 18. Ortiz gets a pair of early takedowns. Mezger catches Ortiz in an armbar, but Ortiz breaks the hold. Goldberg calls this the biggest rematch since Royce Gracie vs. Ken Shamrock at UFC 5. Ortiz has the advantage on the mat. Mezger goes for a keylock but can't get the submission. Ortiz is on Mezger's back and keeps clobbering him in the head, and McCarthy stops the fight. To celebrate, Ortiz fires finger guns at the Lion's Den guys and flips them the double bird. Shamrock starts jawing at Ortiz until McCarthy picks Ortiz up and carries him away. Ortiz says he wants to fight Frank Shamrock or Vitor Belfort, and he also wants a title shot. Perretti says Ortiz may face Evan Tanner next. Goldberg talks with Mark Coleman, who says he's proud of Randleman for his win over Smith earlier in the night. Coleman says he would like another shot at the heavyweight title, but not against his protégé. Randleman sings "Happy Birthday" to his son, and we are out!